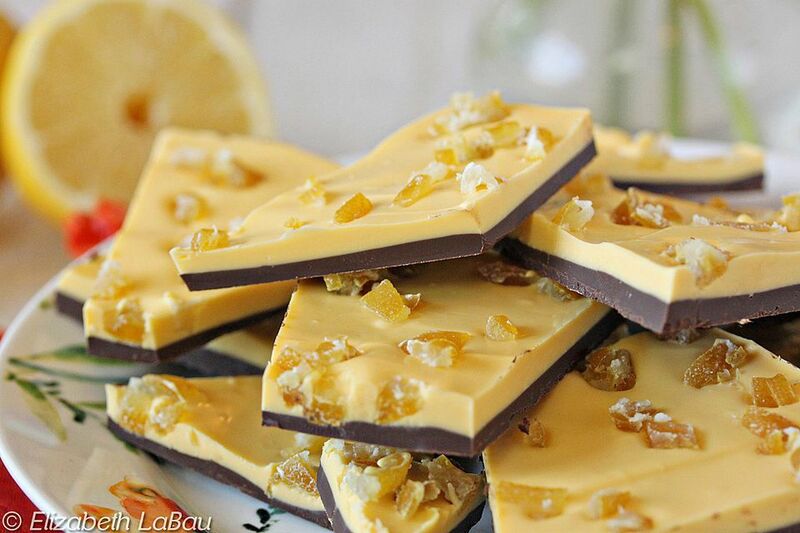 Lemon bark features layers of bittersweet chocolate and lemon-scented white chocolate, topped with vibrant candied lemon zest. It's an easy recipe that everyone will love! This recipe calls for lemon oil and yellow candy food coloring. Unlike lemon extracts and regular food coloring, which are both water-based, the lemon oil and candy food coloring are both oil-based. This means that they will mix into the melted white chocolate smoothly and evenly, without causing any clumps or seizing. Both of these products can often be found at candy supply stores, craft stores like Michael's, or online. Prepare a baking sheet by lining it with aluminum foil and smoothing the foil. Melt the bittersweet chocolate in the microwave or over a double boiler, and pour on the baking sheet. Using a spatula, spread the chocolate in a thin layer and place in the refrigerator to set. Melt the white chocolate in the microwave or over a double boiler, stir in 1/4 tsp of lemon oil, and add a few drops of yellow candy food coloring. Taste the white chocolate and add a bit more lemon oil, if desired, for a stronger flavor. Pour the white chocolate on top of the dark chocolate, smoothing in a thin layer. While the top layer is still wet, sprinkle on the candied lemon peel and press gently into the chocolate. Place the tray in the refrigerator to set the chocolate completely. Once set, break into small irregular pieces and serve. Store Lemon Bark in an airtight container for up to two weeks. If you live in a warm environment, consider storing it in the refrigerator to prevent melting. Note: If you are planning on having this candy at room temperature for long periods of time, you will want to temper the chocolate to make it temperature-stable, or use chocolate candy coating instead.